I got my brp with a broken chain adjuster on the right site, anyone know how to fix that? Mine did the same thing. Water gets in the hole from the chain slider and bracket for the rear brake line causing the bolt to cease in the threads. I picked up a new adjuster bolt( xrs only quick change now) found out the thread pitch, and went down to my local NAPA aout parts dealer. They have thread repair kits or thread inserts that will fix it right up. Basically you drill out the remainder of the bolt and the hole to a slightly larger size. ( remember to make a center punch in the middle of the remaining bolt piece) Tap the hole with the supplied tap in the kit and insert the thread coil. (break off the tang so your adjuster bolt will thread all the way through) I applied some high strength thread lock so it will never come out. After it dries you can reassemble. I also applied anti-seize to the adjuster bolts. You might also want to remove both adjusters and blow out all the condensate with compressed air, then spray a bunch of WD-40 or some other moisture displacing liquid into the swing arm. That will help as well. good luck and keep the drill straight!!! I don't what you call them over there, but here we've got these things called 'Easy out's'. Basically they are like a tapered tap with a left hand thread. (you can pick up a set from a good hardware or engineering shop) You drill a small hole down the guts of the broken bolt, insert the stud extractor and hopefully wind it out. Thats the theory anyway. Make sure you give the offending bolt a good soak in penetrating oil, like overnight, or you will be pretty much wasting your time. I know this to be true cos I snapped an adjuster off in the swingarm of my SS 900 Duc. Followed by snapping off the stud extractor in the painstakingly drilled out hole. Followed by the loudest profanity ever known to mankind. im gonna drill it out and see whats left after that. I drilled out mine last night with an 8.8mm drill bit and then tapped the holes with an M10 x 1.25 tap, and wound in new bolts and nuts and job done in an hour and a half. (must drill small pilot hole as a guide first and keep drill as straight as possible). Nope, not so, there's a better way to prevent this. Copaslip, Coppercompound, Copperpaste or whatever it's called in your neck, that is the stuff that works. Prevent seizure of all threads, and putting a bit on the thread of your sparkplug also does wonders. A thin smear on the back & sides (not the front, just in case) of brakepads also works a charm, it will keep moving and dis/assembling. Dave_o wrote: I don't what you call them over there, but here we've got these things called 'Easy out's'. Basically they are like a tapered tap with a left hand thread. (you can pick up a set from a good hardware or engineering shop) You drill a small hole down the guts of the broken bolt, insert the stud extractor and hopefully wind it out. Thats the theory anyway. Make sure you give the offending bolt a good soak in penetrating oil, like overnight, or you will be pretty much wasting your time. I just snapped off both of my adjuster bolts. The left one is flush with the frame. 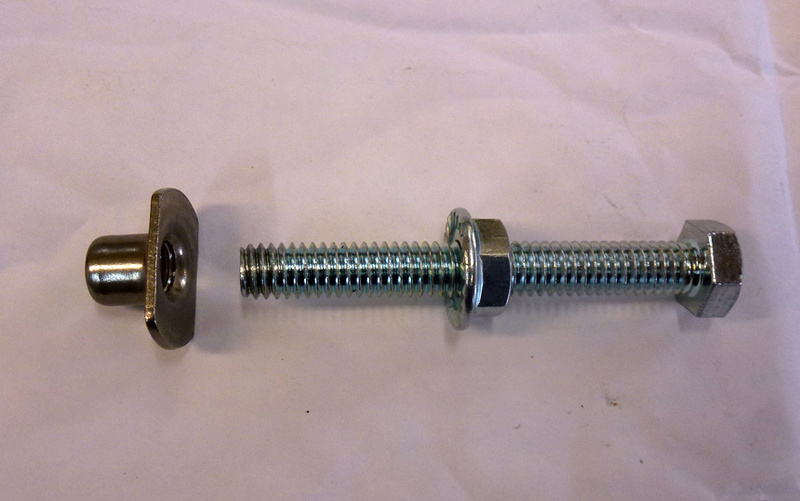 The right side bolt sticks out 1/4 of an inch. I snapped off an "easy out" in the right side adjuster bolt. I never rode in the water. Why would they seise other than the dissimilar metals? If I drill out the old bolts' will the remaining part of the bolt in the swing arm cause any damage bouncing around in the swing arm? Going to be impossible to get the remains of the old bolt out of the hole....annoying I know it would do my head in, as mentioned copper slip on the threads is a must, any dampness along with the dissimilar metals will cause them to seize in. Ricko's got an idea to solve your problem. He mentions 'Pur", and that's a tradename for Polyurethane Insulation Foam. Put your bike such that the swingarm-ends point down so you're sure the bolt's "waste" sits there. Then blow some of this foam in, it will last forever. Mind though, only a little, it expands quite a bit, especially so when it is moist. It will lock your debris inside up, forever. Let it harden for a day, re-tap your holes, put coppaslip in & off you go. Those "easy out's" are cheap - and rubbish too, but let me explain. They're tapered left-hand taps basically, quite hard hence brittle. They find 'grip' by tapping themselves into the bolt-remnant, and in doing so they try to expand the bolt - which already is stuck, but now even more so! The result is, more often than not, that they simply snap off, they cannot handle the torque required but also add to it due to the way they grip. There's a better one, dunno the trade-name: it is a square-bar tool with a smaller end, it tapers down to a parallel smaller piece of square bar. This small piece is slightly turned/torqued to the left, however maybe some 15 degree only. You drill a hole in the bolt (same like with the easy-out), then you hammer the small square end in this hole, and then you turn (with a shifting spanner) the tool & bolt out. Of course you lube with penetrating oil first, overnight is a good idea, maybe you want to apply a little heat even, and the hammering-in will shock the bolt loose. They do not wedge themselves in like the easy-out, and they work more often than not. Oh, yeah, a lil' more costly, but then these are proper tools, and they can handle the torque required, so good even that normally (when the bolt is REALLY stuck) they will cut themselves loose inside the bolt's small hole, they will create a large small hole rather than snapping off. But the chain-tensioner bolts will not do that if you do the above. Use coppaslip Aurora, it's the end of your problems. I just read that one of your bolts is sticking out a bit still - that's an easy one. Got a small square file? Use it to file two parallel flat sides, very close to the swingarm ie not at the end of the bolt, as you want to tap on this end. Assuming you did put penetrating oil on overnight, next you tap lightly on the end of the bolt with a hammer (or hammer & driver/punch) whilst you try to turn it with a small open spanner. When it 'goes' turn to either side - to work the lube in! - whilst you keep tapping lightly, as this will save the thread perfectly. Yeah, having 3 or 4 hands will help here, but isn't this why you've got friends? In general, on this "tapping" following. Never 'whack' any bolts stuck in aluminium. The latter is soft material, it will succumb & deform when you give in to your primal destructive testosterone-induced urges. Rather tap lightly, as it then also moves a bit - and no, you won't see the movement, just trust me it does! Yes, it will take longer, but, together with some penetrating oil, which will really work itself inbetween the parts as they do move during tapping, this will invariably work! Not so with steel & steel as rust is a bastid, but alu & steel.... can't rust together now can it? I think this is a good thread to explain how coppaslip/coppercompound/copperpaste works, and what it does. "Coppaslip" is a brandname. It is an emulsion of very fine metal pieces suspended in an oil, the latter also helping to lubricate a bit. Mind though, this oil tends to disappear over time, leaving only the fine metal 'dust'. As the name implies Copper is the main ingredient, however Coppaslip used to contain Lead as well - but that's not allowed anymore these days. Also other metals are in there, I believe Zinc and maybe Tin (read the package, they all differ), and I doubt if you'll find Cadmium in any of them (also forbidden these days). Of course all this fine metal is electrically conductive. Now, 2 dissimilar metals, for instance aluminium & steel, will electrically 'react' with each other. The proper word for this is spontaneous potential or self-potential, and, as they are different, a small current between them will run. With this current also some material will 'dissolve', it will break out of the material, and this will deposit itself on the other material. It this happens for a long-enough time then small cavities (play!) may be filled with this material. Add oxidation - binding with oxygen - and the volume of this 'loose' (it isn't really) material will increase, and this is a way components will seize. Add copper-compound inbetween these two materials. First of all this, in very thin layers only mind!, is conductive, hence the current generated will go through it. But also, this stuff has a number of other, different metals in, so effectively you 'add' metals. These metals, because of their spontaneous potential, will 'sacrifice' themselves, they react first, leaving the two original metals intact hence protecting them. This results in (almost!) unaffected surfaces of the original metals, hence they will not seize together making disassembly easy. These copper-compounds are often referred to as Anti-Seize Paste, for obvious reasons. Mind though, because the main ingredient is metal(s), it is also highly suited for very hot applications, between turbine-housings for instance, and also on the back & sides of brakepads..... NOT on the pad's front of course, because of the OIL in it, I just mention that here. And YES, I know some twats who did this, one of them having an accident due to it... so never do! Used properly it will prevent the pads from sticking in the caliper, therefore eliminating 'squeek' also. Copper-compound is not a gasket-maker, but may be used to lightly coat your exhaust gaskets. Removing them will be easy. Also a thin smear between the various joints/parts will help, and once you have disassembled your system you will never not use it anymore! Pls note, for mounting Titanium exhausts you better use the Ceramic paste (also an anti-seize paste) specifically for this material. Hope this may help anyone. If anyone out there has some Coppaslip, the old discontinued old with Lead in, in his garage/workshop know I want it - as it is superior. I'll pay a premium for it, PM me if you want to sell it to me. Mind, it must have the Lead in, it will say this on the package. Today I am going to put a heli coil in the swing arm due to the snapped off adjustment bolts. I didn't take the swing arm off. So I am curious if the remainder of the bolt, stuck in the swing arm will damage the swing arm bearings? What do you do to correctly torque all of the nuts & bolt on the swing arm? Do you have the special Honda tool to properly torque the various Nuts and bolt? I will look for this Polyurethane Insulation Foam. it wil not come to the swingarm bearings, that part is massive and the rest towards tha rear axle is hollow. rikco wrote: it wil not come to the swingarm bearings, that part is massive and the rest towards tha rear axle is hollow. If you would please check for me. What did you do to properly torque the new swing arm into place? Also a torch works to loosen metal parts, if the bolt seems not to be moving grab a torch and heat it up, also use penetrating oil...maybe heat and cool it a few time...should come right out. Its also a good way to get a bolt out that has been red threadlocked together...as the heat burns up the locktitie stuff. funny question - use a torque-wrench? I'm presuming now you made the home-made tools Borynack described on his site? If the point is that you don't have a torque-wrench.... borrow one, or trailer it to a workshop? Anybody who is knowledgeable enough in my opinion is allowed to borrow my tools... which I actually dislike but I will anyway. However, the borrower will pay a refundable deposit of at least the new-value of the tool involved. Had to drill it out and use a Heli Coil. My belief is the the adjuster bolt done not carry any load. They only provide a stop to position the rear axle to properly be torqued into position. Frosty, try MrCycles.com, think the swingarms were $537.54US + shipping. What's up with fleabay Frosty....always popping up on there m8 ? Thank you for the advice lads , i will look it up . This was in the "Bionic leg" thread, 2nd page, about 1/2 way down. They sell them at rocky mnt atv, Probably other places also. [quote="DoctorXRR"]The chain adjusting bolts snapped off in the swingarm, due to corrosion on the threads. All I can say is thank goodness for the SwingArm Buddy! The most difficult (and most important) part of the procedure is drilling out the broken bolts. You have to work your way up to with two smaller diameter drill bits before using the 3/8" bit provided in the kit. At least one of the smaller bits needs to be extra-long, otherwise your it will not clear the swingarm and you will drill crooked. Also critical, is making a very deep center punch mark - in the center of the broken bolt. I hit the center punch several times to be sure to get a deep punch mark. The finished 3/8" hole must be centered in the swingarm... not a procedure for the squeamish! The kit makes a very solid repair and I applied anti-seize to the new adjusting bolts. The only down-side to the kit, is the new bolts are 5/16" american, which means you have to use a 1/2 wrench to adjust your chain, which may mean having to pack an extra wrench in your tool kit, although you might still get away with using a 13mm metric. The steel insert is slightly over-sized compared to the 3/8" drill bit, so it is a good press fit into the swingarm.